DUMTUMS is a way of ensuring good presentation in every piece of work. 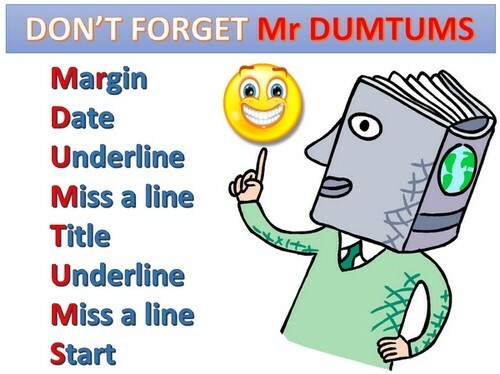 Schools using DUMTUMS will introduce it to those in key stage 1 so that children learn to use the same step-by-step process at the start of every lesson. The date is written in full on the left hand side of the page and all underlining is done with a pencil and a ruler. Underline- with pencil and ruler.